We have a choice of 4 holidays covering the whole route, from 6 to 10 days walking, depending how far you wish to walk each day. If you don’t have time to do the whole route, we have holidays covering each half of the route. And finally, there’s our South Downs Short Break, a round walk over Beachy Head and the Seven Sisters, between Eastbourne and Alfriston. We offer 4 holidays covering the whole route. The 6 day holiday has 4 long days and should only be attempted if you are fit and used to walking long distances day after day. The 9 day trip is done at a more leisurely pace. 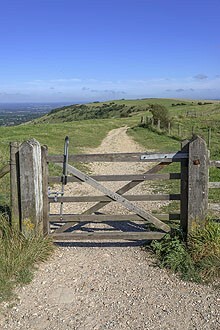 Most people spend 7 days walking the whole South Downs Way. Please bear in mind that both the 7 and 8 day options include one longer day of about 21 miles. The eastern section has wide panoramic views. It finishes with a spectacular cliff walk over the Seven Sisters, where the South Downs meet the sea. This is a 2 day circular walk from Alfriston, passing the famous Long Man of Wilmington, Britain’s largest chalk figure. 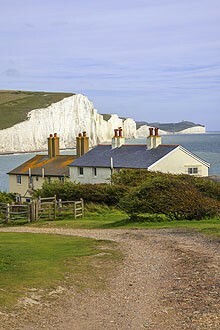 After spending the night in Eastbourne, you walk along the top of the spectacular Seven Sisters before heading inland, via the Cuckmere River, back to Alfriston. It all worked like clockwork to create a perfect holiday. Even the weather was spot on! You helped me fulfil a dream. For many years I wanted to walk Seven Sisters! New start, before retirement. I did it! All was perfect, even the weather. Thank you. Using Mickledore was easy and the service was excellent. Accommodation was all to a good standard for the price and you gave the impression that you cared about my holiday. Would definitely use you again for walks in the UK.